Successfully Added Multi Function 6-in-1 Digital Compass, Weather, Altimeter, More to your Shopping Cart. 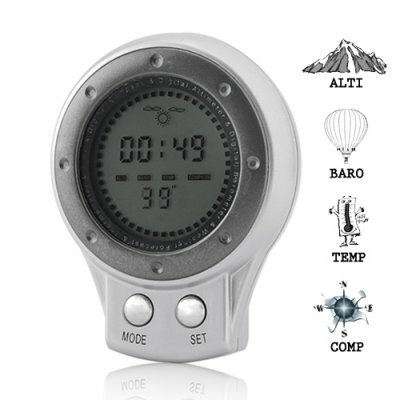 This multi function altimeter is all you need to take with you when where ever you go! It provides you with real time data on weather forecasts, compass bearings, atmospheric pressure and Precise ambient temperature. Digital Barometer: Atmospheric pressure on your wrist! It may seem like science fiction, but it's true and it's available on this multi function altimeter. This Digital Compass, Altimeter, Barometer, Thermometer, Weather Forecast & Time will be your best friend when you're outdoors. It has a super bright 5 second LED backlight and oh yeah, it also predicts the weather based on temperature and atmospheric pressure readings. Did we mention it tells the time too?! Pick up your multi function 6-in-1 digital altimeter for the great outdoors today before we're out of stock tomorrow. Brought to you by the online leader of wholesale direct from China electronics - Chinavasion. Note: This great new product is available factory direct low china wholesale price.Stocked in our warehouse for immediate order fulfillment and worldwide shipping to any destination whether it's you or your customer. What is the accurancy of the weather forcast?